Yes, it is me! I’ve not dropped off the face of the planet…just busy with other stuff. Thought I’d try and stoke my mojo by taking the Online Card Classes Holiday Workshop 2013. Lots of fun stuff and fabulous ideas from top notch designers. I was also inspired by the color challenge at Splitcoast Stampers today. The colors are Island Indigo, Bermuda Bay, Coastal Cabana, Smoky Slate and Pool Party. The following colors were substituted on my card: Hero Arts Shadow Ink in Pool, Soft Stone, Tide Pool and Soft Pool. The dessert option is a buffet…choose your own…mine was sparkle and shine. Simple design, easy to create multiple cards for Christmas. 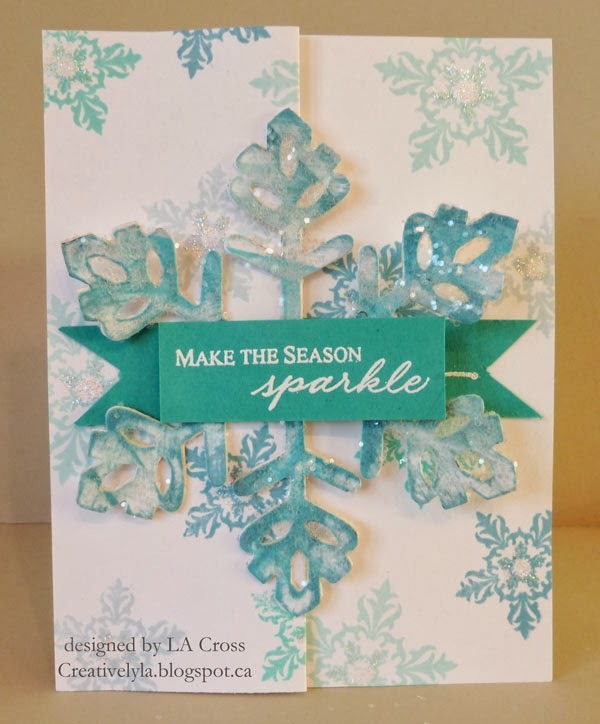 Stamped various colors of ink in two different sizes of snowflakes all over the card stock. Scored it at 2 1/8″ and 4 1/4″. Then I die cut the snowflake in a heavyweight card stock, used the direct to paper method to color it in all the same colored inks. Smeared a layer of Glossy Accents on it and then sprinkled it with glitter. Each of the stamped snowflakes has a bit of Star Dust Stickles on it too for even more sparkle. Snowflakes are from Verve and the sentiment is from Stampavie. The die cut snowflake is from Sizzix. Heat embossed both the outside and inside sentiments and done! LORD, I'm so glad you've resurfaced!! Missed you and CASEing your stuff, sistah! This is lovely! I'm knee-deep in the chipboard mini albums. I'd love to see you take one on…between your drawing ability, color savvy and love of mixed media…well…you'd knock this out of the park! Sending big hugs and positive energy your way! Ooh I am lovin' this Lee-Anne! The colors and the way the sentiment is tucked in the snowflake! HAve a fantastic weekend!